Gather your friends and family and arrange an epic day of paintball! Book your IPG tickets now to secure our exclusive offer of your first 100 paintballs for only $9.99 per person. Sale is on for 3 days only, so don’t miss out! Booking in advance essential, call 0800 004 309 by 10am 14.8.18. 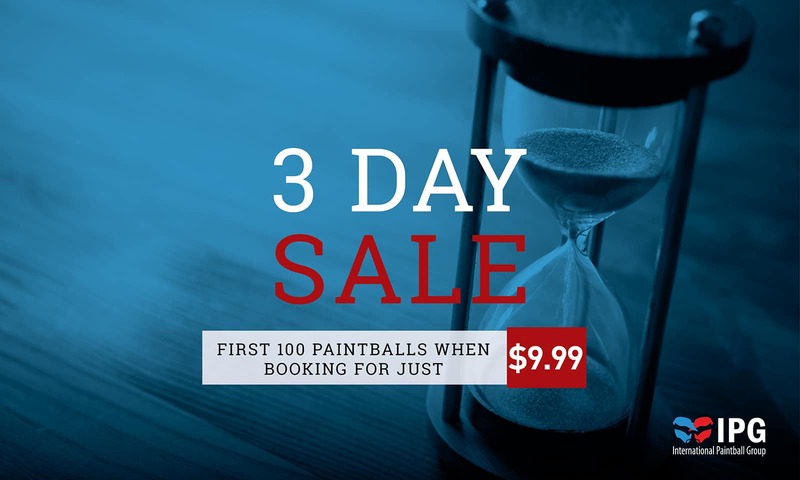 $9.99 per person for the first 100 paintballs when booking IPG tickets. All payments are non-transferable and non-refundable. Not to be used in conjunction with any other offer. Not valid for Miniball. Valid when booking at Delta Force locations only. Additional paintballs can be purchased on arrival at the paintball centre or pre-ordered at time of booking. All other standard T&Cs apply.